University students in towns throughout Germany burned tens of thousands of “un-German” books as part of the Nazi push for state censorship and control of culture. German university students were among the vanguard of the early Nazi movement. On April 6, 1933, the Nazi German Student Association proclaimed a nationwide “Action against the Un-German Spirit,” to climax in a literary purge or “cleansing” by fire. 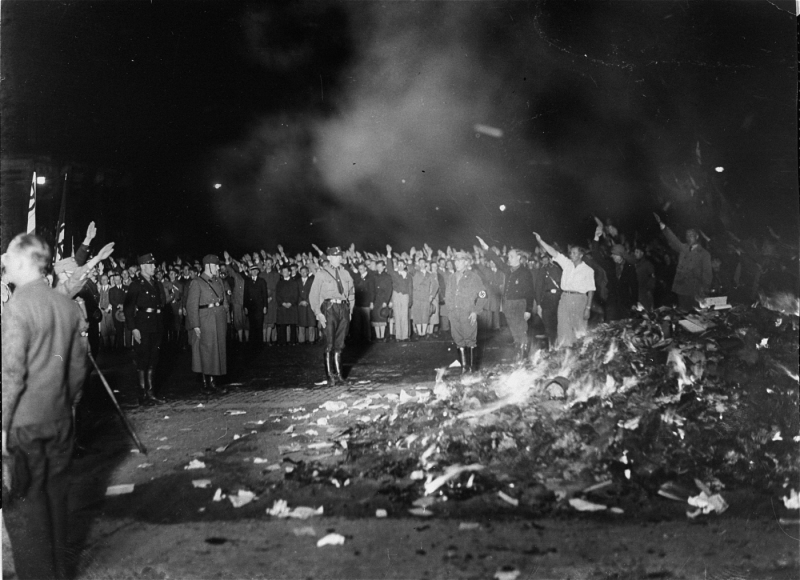 On May 10, 1933, university students in 34 towns throughout Germany burned upwards of 25,000 volumes of “un-German” books, presaging an era of state censorship and control of culture. The students threw books onto large bonfires with great ceremony, band-playing, and so-called “fire oaths.” In Berlin, some 40,000 persons gathered to hear Joseph Goebbels speak. The May 10 nationwide program was a success, eliciting widespread newspaper coverage. Radio broadcasts brought the speeches, songs, and ceremonial chants “live” to countless German listeners. Among the authors whose books students burned that night were well-known socialists, such as Bertolt Brecht; the founder of the concept of communism, Karl Marx; critical “bourgeois” writers like the Austrian playwright Arthur Schnitzler; and “corrupting foreign influences," including American authors, Ernest Hemingway, Jack London, Theodore Dreiser, and Helen Keller. Jewish authors were singled out, too, with the books of Franz Werfel, Max Brod, Stefan Zweig, and Heinrich Heine thrown in the bonfires. The book burnings were a visual affront to one of America’s most treasured freedoms—the right to the free expression of ideas. Following on the heels of a procession of abuses against Jewish citizens, the book burnings evoked widespread protest among the American press and public. The American Jewish Congress deliberately chose May 10, 1933—the pre-announced date of the Nazi book burnings—to coordinate massive, nationwide street demonstrations against the Nazi persecution of Jews and the burning of books. The organized protest served as a catalyst for anti-Nazi groups wishing to publicly denounce the civil violations of the Hitler regime. The largest protest took place in New York City, where up to 100,000 people marched for six hours decrying events in Germany. At the time it was the largest demonstration in New York City history. Other mass demonstrations by a variety of American groups took place in cities across the country, including Philadelphia, Cleveland, and Chicago. April 1933 News articles, editorials, op-eds, letters to the editor and political cartoons regarding the German Student Association's call for "Action against the Un-German Spirit." May 10 - 17, 1933 News articles about the Nazi book burnings. May 11 - 31, 1933 Editorials, op-eds, letters to the editor, and political cartoons reacting to the book burnings and Nazi suppression of free speech, expression, and political opposition. Birchall, Frederick T. “Burning of the Books, May 10, 1933.” In National Socialist Germany: Twelve Years that Shook the World, edited by Louis L. Snyder, 101–104. Malabor, FL: Krieger, 1984. Stern, Guy. “The Burning of the Books in Nazi Germany, 1933: The American Response.” (external link) Simon Wiesenthal Center Annual 2, (1985): 95–114. Stern, Guy. Nazi Book Burning and the American Response: Distinguished Lecture. Detroit, MI: Wayne State University, 1991. United States Holocaust Memorial Council. Nazi Book Burnings and the American Response. Washington, DC: United States Holocaust Memorial Council, 1988.